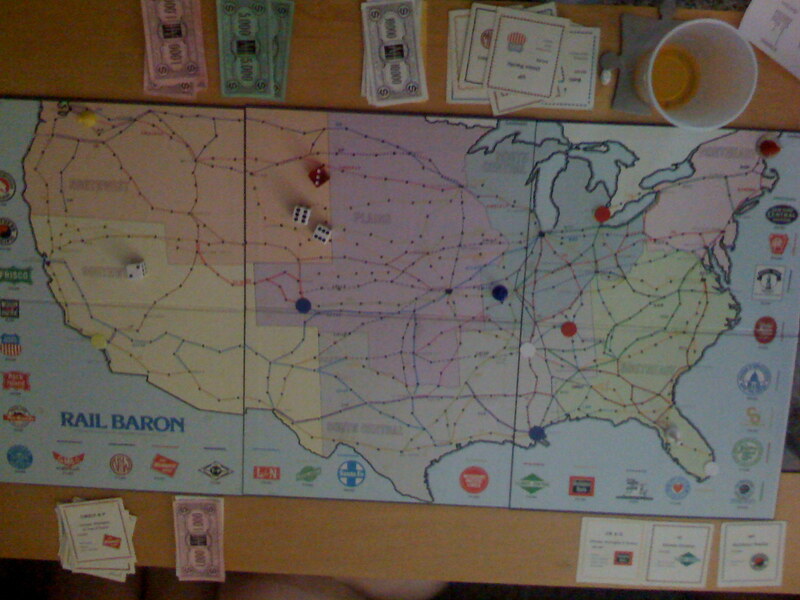 Rail Baron is a board game from 1977. It plays similar to a monopoly with multiple paths where at the end of each die-determined destination, the player can choose to then buy any route. Any route not owned by a player costs $1k to use, any player route costs $5k. Once all the routes have been purchased it bumps up to $10k. This is a pretty fun, if mostly luck driven, game. Owning a monopoly to an area of the board is *very* useful, but if no one rolls there then it is useless. The game also takes a LONG time to play through, so I recommend having a good group of people you can have a fun conversation with at the same time. Since there isn’t as much strategy, you can’t really whittle away the hours simply starring at the board. Like Monopoly, it is a social game.